If the abundance of the Internet still leaves feeling a little empty, perhaps you crave the comfort of a good book... a book about Everton Football Club? Or players Past and Present? The titles below provide links to more detailed descriptions and reviews, if available. 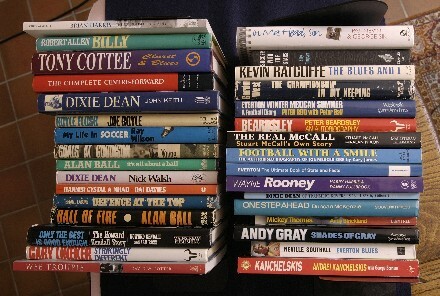 Thanks are due to David France and his book, Toffee Pages, which includes a list of 57 post-war Everton Books. Produced by the makers of Everton's Matchday Programmes, this glossy colourful booklet features one-page profiles for this season's squad, and "superb" colour pictures of your favourite players, a potted Everton History, and a statistical record of the 1997/98 season for all Everton teams – except the ones who actually won their league: Everton Ladies. Alan Smith & Stuart McCall, 1998. Stuart McCall relates many tales of his time as a professional footballer in this book, including the tragedy of the fire at Bradford City and the triumph of medals and trophies in England and Scotland. All the tears and laughter that make up football life are included. Price: –9.99 (Paperback) Order from Jodenoy's. An update of his 1992 Centenary Edition, this large-format celebration of Goodison Park is even better. Price: –16.99 (Hardback) Order from iBS. The third book in a unique series by dedicated Evertonian, George Orr. George again presents the fan's eye view of following Everton during one of the most successful periods in our illustrious history. Or –5.00 from George Orr himself outside the Winslow Pub, before home games. An update of his 1995 Edition, this has entries on many topics related to Everton, and includes biosketches of many key players. Price: –8.99 (Paperback) Order from iBS. A large-format (A4) update of his 1992 Edition, with full details of Everton players through till the end of the 1997-98 season. Nice write-ups and unique photographs for almost every player of the modern era. Price: –14.99 (Paperback) Order from iBS. This pivotal book in the history of Everton FC has been beautifully reprinted, complete with the original illustrations. Thomas Keates' History of the Everton Football Club is one of the classic soccer histories. Only a handful of famous British clubs published comprehensive histories back in the 1920's. This was among the earliest and one of the best. The graphic and exquisitely written story takes the reader through the club's complicated birth and the early quest for honours. Our first FA Cup triumph and three Championships are included, culminating with the very special one in which Dixie Dean scored his unbeatable 60 league goals. Price: –14.99 (Hardback) Order from iBS. Neville Southall with Ric George, 1997. Neville Southall's new book 'Everton Blues' (rrp: –6.99) is the hard-hitting diary about the 1996-97 season and will be available to Everton fans from November 1997. The book is available from all good bookshops and the Everton Megastore / Mail Order. Copies of the book can also be ordered direct from the publisher by sending cheques or postal orders for –7.49 including postage and packing (UK only) to B&W Publishing at: 233 Cowgate, Edinburgh, Scotland, EH1 1NQ. The International rate for all destinations outside the UK is –8.49 – send Sterling cheques or International Money orders in English Pounds to the same address. Pat Nevin and George Sik, 1997. Dr George Sik, has written a book with the former Everton player Pat Nevin sub-titled The Footballer's Mind Revealed. Sik, a psychologist who specialises in the study and assessment of personality, says that the essence of getting the best from a team is knowing its individual parts. He thinks that each player must be seen as an individual. "Managers need to recognize that everybody in the team is very different. It's knowing them well, knowing which one needs motivating, which one doesn't, that gets results. "Pat's told me about the old, traditional manager who has this pre-match clique about spending the last 30 minutes getting your mind in the game. It doesn't work for some. Some are far better with head-sets on listening to music and thinking of anything but the game. They are wound-up enough already." The expectations of their own media and fans is another factor. "Pat (Nevin) writes in our book of the expectations he found at Everton when he arrived there after their successful period in the late 80s. They actually expected to win the FA Cup. "Now that's ridiculous expectation and players are effected by it. When it's that high players can become nervous. Pat recalled a player so nervous about a big match that he didn't want to play." Matchday Programme: A new A-4 size hardback book intended for supporters of all ages with a passion for football and a fascination for Everton's history. Toffee Pages describes the post-war years at Goodison Park through writings in nearly 3,000 football programmes home and away. This treasure-chest of information traces the evolution of the club from Tommy Lawton to Andrei Kanchelskis and details the coming and goings of great players like Peter Farrell, Bobby Collins, Alan Ball, and Gary Lineker. The book chronicles the FA Cup successes of 66, 84 and 95, and the Division 1 triumphs of 62/63, 69/70, 84/85 and 86/87 as well as the tears of the more frustrating campaigns. Toffee Pages provides season-by-season accounts of the changing faces and contents of programmes involving Everton from the spartan issues available immediately after World War II, to the award-winning magazines which are the pride of Goodison Park today. The book catalogues all Everton's first-team programmes from 45/46 to 95/96 and includes illustrations of over 200 of the rarer programmes. Its a pity that none of the more recent programmes are in colour. The First Edition of the hardback book will be limited to 1,200 copies and can be ordered for –19.95 plus –1.55 postage and packing (UK) from Everton Mail Order or iBS..
Matchday Programme: This A-5 size softback book offers an illustrated and concise pre-World War II history of Everton through the medium of cigarette cards. Toffee Cards catalogues all 312 cigarette cards form the 109 series involving Everton, issued by three tobacco companies between 1897 and 1939. The illustrations and biographies on cigarette cards provide reliable reflections of the early development of Everton and British football in general. Memories of the School of Science are strengthened by the 175 illustrations of Goodison legends included in this book. Toffee Cards costs –7.95 and is available from Everton Mail Order or from The MegaStore or iBS. A season-by-season account of what it was like following the blues in the Catterick era of the 1960's. Written and produced in true fanzine style. A4 size, over 16,000 words and many rare pictures. Originally published as a 40-page personal scrapbook by Blue Blood Publications in 1995, this excellent collection of memories has now been adopted by the Club and republished in a high-quality expanded format as a "proper" book. Premier League Pocket Guide, September 1996. Price: –0.99 Order from iBS. No other information available on this one at present. Janet Goodwin and Len Straughan, June 1996. Perhaps a nice idea for a little book, but predictably dominated by crap about Liverpool. Everton's pace-setting role in the early 1960's is totally overlooked, as is the fact they were the first English club to compete in Europe for 5 successive seasons while Liverpool floundered in Division 2. It is not until the last few chapters that Everton's colours in Europe are given full prominence. The glories of Munich, Goodison, and Rotterdam are re-lived in fine style, with but scant mention of the Red's disgrace at Heysel – a tragedy which cost Everton more in footballing terms than any other team. Price: –3.95 Order from iBS. Tony Cottee with Tony McDonald, 1995. Michael Kenrick: In 1988, Tony Cottee become Britain's most expensive footballer when he joined Everton in a record-breaking –2.05M deal. But, despite scoring a hat-trick at Goodison on his debut, reaching the FA Cup Final in his first season, finishing top scorer for the club in five of his six full seasons on Merseyside, and winning seven full England caps, his time with Everton seemed full of frustrations. He returned to his spiritual home, Upton Park, in September 1994 seeking a new challenge. The life and times of 'TC' are chronicled in detail over no less than 65 short chapters spread over the 368 pages of this tome. A large chunk of the book (26 Chapters) cover his turbulent tenure at Everton, from transfer in to transfer out. His difficulties retaining a first-team place through a succession of managers form the predominant theme, and he poignantly ends with a table counting the times he was subbed, put on the bench, or dropped altogether. But he knows he played for a Big Club at Everton, and he knows the fans stood by him. Interesting reading. Graham Williams: Having bought a copy a while ago of Everton in the Sixties by George Orr, I got a copy of a mailing about his follow up. This is in a similar format (A4 pages; personal memories of events, and lots of pictures of rare things from the that time period). A real fan's book, looking at this dire period very much from the perspective of a true and dedicated fan. Or –3.50 from outside the Winslow before home games. Neville Southall, with Ric George, 1995. Big Nev makes full use of his unrivalled experience as he examines every aspect of goalkeeping and offers his unique blend of forthright advice and encouragement to anyone who thinks they might be able to follow in the Big Man's inimitable footsteps. The emphasis is very much that of a coaching manual, but it includes insight into the game as it is played at the highest level by one of the world's finest goalkeepers. Available from the Everton MegaStore for –7.99. Information from Ed Pepper: Nelson is a professional footballer and avid Evertonian. The book is a diary of 1994-95, our FA Cup-winning season. Along with great insight into being a player, it has some great sentiments about Everton. Strongly recommended. This seems to be a set of six cassettes. Dave Morris: This book promises a lot, but fails to deliver. Now, it's the easiest thing in the world to knock something, but the writing in places is discursive, to put it mildly. The first chapter for instance is all over the place, and continuity is not always apparent subsequently. The author is/was a journalist and he doesn't appear to have any commitment to Everton (which may be fair enough). He goes to great pains to let us know that he knew Howard Kendall 'personally', Harry Catterick 'personally'. He had an in-depth disagreement over nothing in particular with Harry, and of course Harry is not in a position to answer back. He also knew John Moores, Bobby Collins and "all the big names in the Everton team." I guess the non-big names were not worth the effort, or just too boring. A description about Ian Branfoot being followed home in his car while manager of Southampton is given on p 108. A description of Man City's attempts to sign Graham Taylor as manager is given on p 102. A description of Mike England's transfer Blackburn - Tottenham is given on p 70. The above are hardly in accord with the title. Also in a sub-plot we are whisked from 1977 to the arrival of Joe Royle (1994) in the space of one page (p 93-4). I got as far as p 130 before I stopped reading and I guess I'll finish it one day, when I've got nothing better to do, but without obvious enthusiasm. There are also enough errors of fact to convince one that he ain't one of us, or he didn't get someone up on the facts to do some proof reading. Available at –14.99 from the Everton MegaStore. Worried that the memories might fade into the mists of time? Well this might have been the perfect solution: Dave Whiteside who was the editor of the "Reserve Review" mini-programs, wrote a book all about the 1994-95 season. It has 316 pages, and all but the 12 chapter heading pictures are jammed with type telling of every statistic, transfer rumour, match details and added personal dressing for every EFC match of not only the first team, but the reserves, A- and B-teams, and odd reports from the Lancashire and even North West Counties Leagues. Yes, there is far more detail than you could possibly wish to read, but it's strength is not so much it's readability as it's invaluable reference and memory-jerking potential. Price: –5.00 plus –2.00 postage (UK), but the last information was that it sold out some time ago. This small paperback provides full details of Everton first team performances over the last 25 seasons (1970-71 to 1994-95). League matches are presented in a tabular grid format, similar to The Complete Record, with which this book obviously overlaps. There are brief details of all the main cup matches – FA Cup, League Cup, Europe – with scorers and attendances but no team line-ups. The book includes a couple of pages of introduction, with photos of Joe Royle, the FA Cup, and Goodison Park, and finishes with complete League tables for all 25 seasons. and loads of other different topics.. It may contain a few mistakes, but nothing major.. Available from the Everton MegaStore for –5.95, or at a knock-down price of 99p, if your lucky! Rogan Taylor and Andrew Ward (with John Williams), 1993. Michael Kenrick: For the conspiracy theorists, this one will fuel your fears that there is a campaign to make football supporting on Merseyside into one big happy family. Otherwise, it will make a schizophrenic out of any True Blue Evertonian. The book captures in print a lot of material gathered in a series of interviews with players and fans of the three Merseyside clubs. The interviews were originally broadcast in a 32-part series on Radio City over the 1992-93 season. As you might guess, only a third of the book is worth reading – the part dealing with Everton – but that portion does contain some gem-like remembrances. Unfortunately, it is difficult to separate the blue wheat from the white dross and the red slime. The good Everton stuff is mixed in with gallingly nauseating trash about Liverpool and boring drivel about Tranmere Rovers. The book contains 32 B&W photos. Original Price: –8.99. A Biography by Colin Malam, 1993. Arguably his best season was spent at Goodison Park. His best season – and certainly his most successful in front of goal – it rates one chapter of just 10 pages in this biography. The rest is taken up with Gary's formative years at Leicester, the quest for Spanish glory in Barcelona, and the fading years with Spurs and England. A beautiful large-format book that documents the first 100 years of Goodison Park. Includes a contemporary article from the Echo of the critical meeting at which the decision was taken to break away from John Houlding's Anfield lease and set up the club at the new ground in 1892. ...and lots of other match summaries from the past together with plenty of historic photos - all Black and White by virtue of their age. 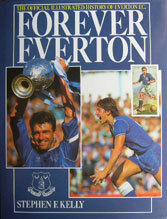 Contains photos and career details of every Everton first-team player from the 1958-59 season to 9 May 1992. Howard Kendall and Ian Ross, 1991. Albert Geldard & John K. Rowlands, 1990. An unusual heavily illustrated record of one man's life in football. The high point of Albert Geldard's career was the 1933 FA Cup Final, where he served up Everton's third goal from a looping corner. Geldard played the major part of his career for Everton, after being the youngest ever player in his debut for Bradford Park Avenue. Steve McMahon with Harry Harris, 1990. Ian Ross & Gordon Smailes, 1988. Everton have had their fair share of glory in the 1980's. This book charts all these and many other great occasions in the club's history. The first edition of Everton: A Complete Record was highly acclaimed when it was published in 1985. Since then, further achievements meant that a new edition was needed. Thus, Everton: A Complete Record 1878-1988 updates and enlarges the previous book. There are the usual features - complete record of each competitive game since Everton joined the League in 1888 (this time with attendances from 1925-6 when the League began keeping records), together with an illustrated biographical gallery of over 150 Everton stars, biographies of every manager, Matches to Remember, a concise history, a feature on Goodison Park, and many more statistical sections. Gary Stevens & Trevor Steven, with Dave Smith, 1988. This book is like a daily diary of Everton life for the two 1980s stars. Each contributes his own recollection and analysis of events during the 1987-88 season their last season together at Goodison Park. Trevor's philosophical yet humourous outlook provides an interesting contrast to the somewhat cavalier and refreshingly honest approach of his England teammate. From the appointment of Colin Harvey as the new Everton Manager, to England's dismal failure at the European Championships in Germany and Gary's subsequent million-pound jaunt north of the border, it makes fascinating reading. Brian Barwick & Gerald Sinstadt, 1988. Hidden in the subtitle is the period 1962-1988, which turns out to be the focus of this celebration of the great Merseyside rivalry. One highlight among many too numerous to mention is the story of the revolutionary closed-circuit tv coverage provided at Anfield when Everton drew Liverpool in the FA Cup 5th Round in 1967. Two of the giant screens blew away in the growing gale just half-an-hour after the end of this historic match. Nice presentation, with classic photos on almost every page. This nice and concise Everton history contains over 100 photos, many in full colour. It starts with St Domingo's but moves quickly through the early years and focuses on the major successes of the first Kendall era. The section on Famous Evertonians has notes on 70 former players, plus Big Neville. Then there are details of 10 Famous Matches, from the first FA Cup triumph, to the ultimate European Cup Winners Cup Final win in 1985. Photographs by Bob Thomas; Text by Rob Hughes, 1987. The story of Gary Lineker's early rise to fame – told in few words and many high-quality photos. It includes one chapter (out of six) on his year at Goodison – entitled –1,000,000 Gem. The text includes some insight into Kendall's views of the time, and a comparison with the man Lineker replaced in the Everton team: Andy Gray. Compiled by Alex Hosie, October 1987. Trivial Pursuit for Evertonians! Alex Hosie has compiled 1001 questions to tax the keenest Blue brain. Questions are grouped into sections with such provocative titles as Where did they go?, Blues in the League Cup, and Remember this Season: - 1962/63. Answers are provided separately in the last part of the book. A day-to-day account of the season of 1985-86 – that promised so much but held such ultimate disappointment. Seen through the soul of Peter Reid, the midfield dynamo at the centre of Everton's quest for the double, so cruelly denied them. Follow him to Mexico and further disappointment as his valiant efforts for his country are not enough to beat Argentina in the World Cup. A full history of the Everton player and manager, tracing his career from Glentoran, through Sunderland, Luton,. Everton, and Port Vale, with emphasis on his influential international record at Northern Ireland. A commemorative record of the 1978-79 season, with great photographs by Harry Ormesher. A second book by Alan Ball, looking back over his full playing career, and giving forth on his views of football from every angle. Alan Ball is nothing if not opinionated: his description of Don Revie, the first in a long line of useless England managers, is well worth reading. Comments about Everton are scattered throughout the book, which is highly readable. And a small table of statistics at the end shows conclusively that Everton got the best out of this tremendous player, even if he was sold way too soon. This pocket-size paperback celebrates Everton's first 100 years in a style that fits earlier rather than later into that tumultuous period. I don't know much about John Roberts, but his writing style, and the style of the entire book, seems as old as Goodison Park itself! Lots of detail about almost every season, its hard to concentrate when being bombarded by names and facts that are now the distant past. He relies a lot on Keates' seminal work, and seems to faithfully reproduce much of that tome in the first half of the book. It includes a Foreword by Joe Mercer and a reference section at the back that details matches through to 1977. Perhaps the most mercurial enigma to wear the blue of Everton? In this book, Duncan tells the story of his experiences at five major clubs. 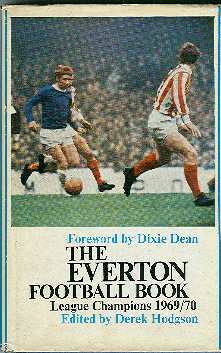 Mike Bersiks: I recently met a fellow Evertonian who lent me this rather interesting book. Walsh (now passed away) did a series of interviews with the great man and provides quite a fascinating read, chronicling Dean's youth and illustrious career until his retirement and later life as a publican. It is written in a quaint old style (Walsh was born in 1915 and presumably saw Dean play on occasions) and sheds some fascinating insights into the man himself, Everton Football Club, the way football was played and run in that era, and on British society as a whole before the war. Obviously, the emphasis is on Dean and his fantastic goalscoring feats which helped Everton to two Championships, the Second Division title and the FA Cup while he was with the club. He comes out as the complete footballer - skillful, deadly with the feet and head, a good passer and link-man but with an appetite for goals unsurpassed since then. What is truly remarkable about his play was his ability to direct a header with unerring accuracy either goalwards or to one of his team-mates. He posted a goal-scoring average of 0.9 per game throughout his career which is unsurpassed by any player before or since. The origin of the nickname Dixie seems to be his mop of curly black hair and swarthy complexion which alludes to a resemblance of American blacks in the Southern States. Although he did not like the nickname and his friends called him Bill, the fans chorus was always "Give it to Dixie." If one can still get hold of this book in the library or at a second-hand book shop, it is worth looking at as an insight into this all-time Everton hero and originator of the Everton centre-forward cult. A brochure celebrating the League Championship Title in 1970. Includes numerous photographs and celebrates manager Harry Catterick's record, winning his third major trophy. A collection of stories of Everton's famous stars of the glorious sixties, the decade in which the cachet of this great club was at its peak, crowned with the League Championship Title in 1970. Foreword by Dixie Dean. Michael Kenrick: Brain Labone was Captain and lynch-pin of the 1960's team that did so much under Harry Catterick, but I found the overall tone of this book a little disappointing. Brian spends a lot of time praising the qualities of contemporary players from other teams, and justifying his decision to retire early from the game, although it is not exactly clear whether he stuck to the plan laid out in this book, since he went on to Mexico in 1970 and played until early in the 1971-72 season. This book includes among the elite, Harry Catterick's Championship-winning Everton team of 1962/63. Perhaps the greatest centre-forward who ever lived? Yes, but for the Second World War, Lawton may have proved to be even better than Billy Dean, who he replaced at Goodison Park in 1938. This book helps us understand why Tommy Lawton, who's eyes were opened wide by his non-combative war experience, fell out with the club in 1945 after scoring with ease through the war years. A compilation by Ethel Warhurst, LLA. The definitive source book for all subsequent attempts to chronicle Everton's early history. It presents the first 50 years in exceptional detail, as seen through the eyes of Club Historian, Thomas Keates, who died in his 79th year, with the fresh memories of Billy Dean's triumphs to console him. Everton Mail Order Recent Everton Books can be purchased in person direct from the Everton Megastore, or by phone from Everton's Mail Order Department. The Internet Bookshop The Best On-Line bookstore for British Books. Will send books to anywhere in the world. The Amazon Bookshop Supposedly the biggest on-line bookstore, this American Company based in Seattle has now gobbled up an English operation, improving its selection of British footy books.